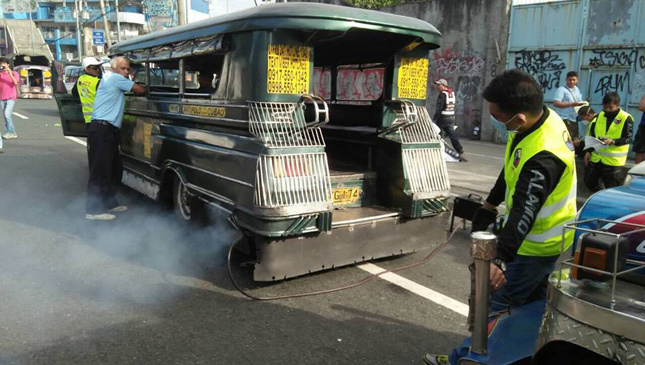 Are you as tired of smoke-belching jeepneys and illegally parked cars as we are? If yes, you'll be glad to know you can now do more than post your frustration on social media. The Department of Transportation (DOTr) and Inter-Agency Council for Traffic (i-ACT) has launched the "Sumbong Bulok, Sumbong Usok" digital chatbot, allowing concerned citizens to report smoke belchers, traffic violators, and vehicles that are no longer roadworthy via the convenience of i-ACT's Facebook Messenger account. Netizens will also be allowed to send photos or videos, and identify the location of where a violation took place. DOTr secretary Arthur Tugade says the new venue for reporting violators provides citizens with empowerment: "The success of this platform in helping realize the objectives of our Tanggal Bulok, Tanggal Usok operations will serve as a solid proof that if the government, its people, and technology are put into one, nothing is impossible. "This platform will not only help citizens send their complaints easily. This will also help our case managers and resolvers monitor the status of concerns. Makikita doon ng DOTr kung anong mga lugar ang pinakamaraming reklamo, at sinong mga ahensya ang hindi sumasagot sa reklamo," he added. Complaints sent to the hotline will be processed by concerned government agencies like the Philippine National Police Highway Patrol Group, Land Transportation Franchising and Regulatory Board, and Land Transportation Office. The power to ruin a traffic violator's day is now at the tip of everyone's fingertips. We just hope this new system isn't prone to power tripping individuals. If you're reading this during the commute home, why not give it a shot?